Fruit, glorious fruit! Click here to play! The crazy, sugary sensation is back, and this time it is paying out exorbitant amounts of cash. 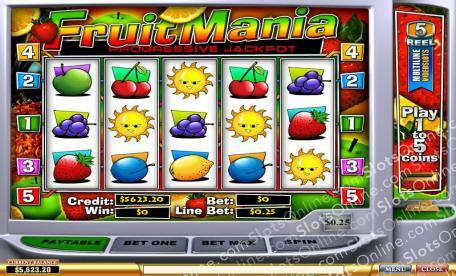 Fruit Mania is an exciting progressive slot played across 5 reels and 5 unique pay lines. No free money can be played at this slot, but if you manage to spin up all 5 Cherry symbols on the fifth pay line you will be rewarded with the entire Fruit Mania cash jackpot. The Cocktail Glass is Scattered and can be found anywhere on the reels in order to earn a payout. There is also an exciting Bonus Game on offer where if you spin up three or more Suns on an active pay line you will trigger the lucrative Bonus Round. Fruit Mania has plenty on offer for those interested in taking home the biggest cash jackpots, so get on down to this wonderful progressive right now! Cocktail Glasses are Scattered, which means that they can appear anywhere on the reels to trigger a payout in a winning combination. The Bonus symbol is the Sun, and if three or more show up on an active pay line you will be sent straight to the Bonus Round.